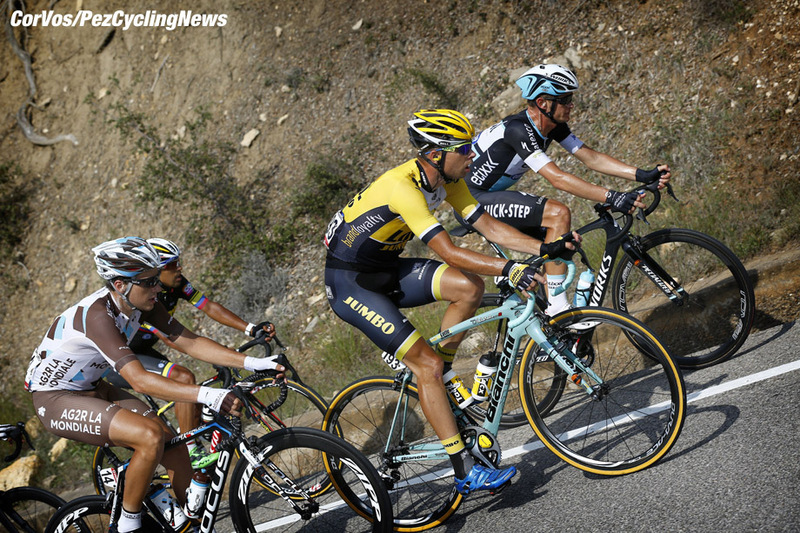 PezCycling News - What's Cool In Road Cycling : Vuelta’15 St.12: Van Poppel Pops In Lleida! 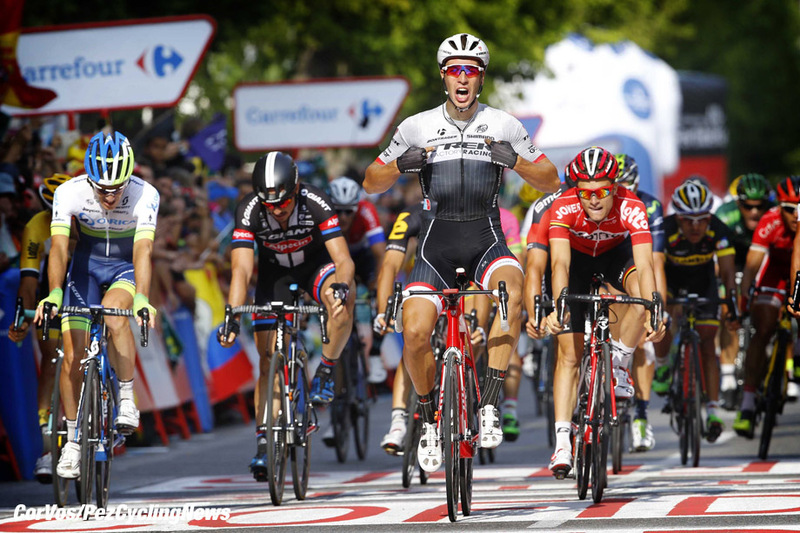 Vuelta’15 St.12: Van Poppel Pops In Lleida! Race Report: Danny Van Poppel puncture with 10 kilometers to go and rejoined the peloton without the help of his Trek teammates, took a couple deep breaths and then won the sprint at the end of Stage 12 into the Catalan town of Lleida. Nice win for Trek and the overall is unchanged. Not one of the most exciting stages, but looking at all the previous etapas, there has to be one ‘easy’ stage. Stage 12 was always going to be a day for the sprinters, but there are not many left in the race and the sprint-trains are not what they could be. The stage went to plan: The early break got a nice lead, not too big, and was slowly reeled in to be caught in time for the sprint. Danny Van Poppel punctured on the run in, but he took it all in his stride and blasted over the finish line for the win. The 173-kilometer stage 12 should be a less stressful time for the Vuelta peloton than the previous day in Andorra. The course runs mostly downhill from Andorra to Lleida in a repeat of a stage in 2010. The only obstacle of the day is the Cat 2 Coll de Bóixols, which starts after 38.5 kilometers and climbs 800 meters for nearly 16 kilometers. Should be a bunch sprint, but who can predict anything in this Vuelta? Big news of the day was that Chris Froome would not be starting as he broke a bone in his foot only a few kilometers into stage 11. 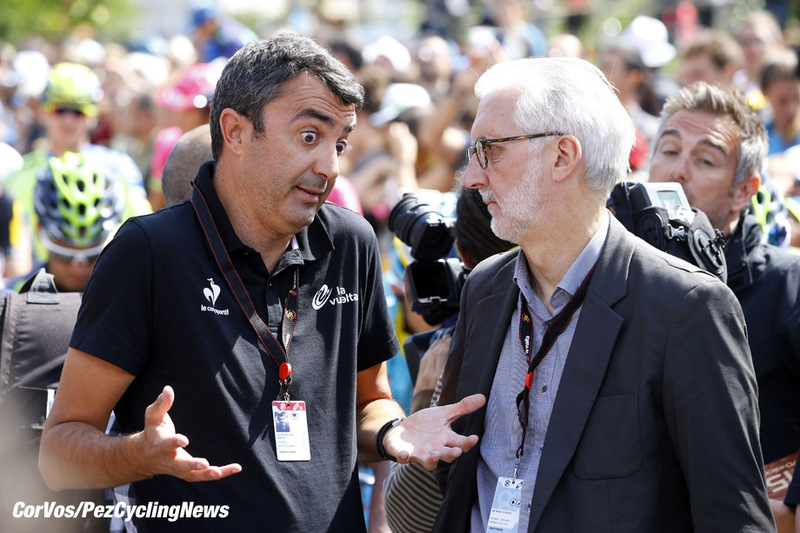 Before the start; Vuelta race director, Javier Guillén, a UCI commissaire and a representative of Spanish TV company TVE, met with the sports directors of the Tinkoff-Saxo team to discuss rider safety and the team continuing in the race. - Race director will issue a radio communication to all vehicles that safety of the rider is the first and paramount objective and that no risk should be taken to get a video or photo of riders. - The minimum safety distance between in-race motorcycles and riders is doubled from the current 5 to 10 meters. - The organization will thoroughly review and assess the status of all drivers of motorized vehicles, including their driver licenses, qualifications and experience, in order to ensure they are fully capable of safely performing their job. Given this first step, the Tinkoff-Saxo squad took to the start of Stage 12. Tinkoff-Saxo’s management agreed to start today’s stage under the condition that the team will remain in the race as long as safety is guaranteed while it will be forced to retire from la Vuelta a España if another accident similar to the ones that involved Peter Sagan and Sergio Paulinho takes place again. After the usual furry of action from the gun with riders trying to escape for the break of the day, eventually a group of five looked to have been allowed to succeed. Again it was stage 7 winner, Bert-Jan Lindeman (LottoNL-Jumbo) in the mix along with Maxime Bouet (Etixx - Quick-Step), Miguel Ángel Rubiano (Colombia), Jaco Venter (MTN-Qhubeka) and Alexis Gougeard (AG2R-La Mondiale). The Astana team of overall leader Fabio Aru came to the front and shut everything down and the break started to build up a lead. Maxime Bouet is the best placed of the front group in 24th place at 20:44, so not much for Aru to worry about. After 40 kilometers, at the start of the climb of the Coll de Bóixols, they had a 3-minute advantage. At the summit of todays climb the lead was up to 5 minutes as Bouet led over the top. The peloton had come under the control of the Giant-Alpecin team who must be working for John Degenkolb who won four stages in the 2014 Vuelta and the green jersey, but nothing so far in this edition. Trek also began to work to pull the break back from 5:30. By the feed zone with 85 kilometers remaining, the lead had been cut by 1 minute, but the peloton will not want to get too close this early. Up the uncategorized climb of the Alto de Fondlonga with 55 kilometers still to race, the lead was dipping under 3 minutes and the inevitable was starting to look very… inevitable. The five out front were all working well together, but with the combined strength of Trek and Giant-Alpecin with Astana waiting in the wings, they had no chance. Bert-Jan in the break again! The lead was 2:20 at the intermediate sprint in Gerb as Rubiano rolled across the line first; Giant and Trek were still the dominant team in the chase, although Lampre-Merida were joining in. MTN-Qhubeka rider, Louis Meintjes will be with Lampre next year and Bob Jungels is on the move from Trek to Etixx – Quick-Step for 2016. Lampre-Merida had put two riders up front to mix in with Giant-Alpecin and Trek making it look like a build up to a battle between Maximiliano Richeze, John Degenkolb and Danny Van Poppel. As the gap dropped under 1:30 the peloton was stretched single file, but the catch was very slow. 13 kilometers out and Danny Van Poppel punctured, but with a very fast change he was still in the cars, but the chase will take the edge of his sprint. Trek eased down at the front which gave the break some more time out on the road, but as soon as Van Poppel was back on board the speed lifted again. In to the last 6 kilometers and the front of the chase was a mix of teams with everyone moving forward. Astana were looking after Fabio Aru, the others were just jockeying for position. On the long, straight road to Lleida, the bunch could see the break at 23 seconds as they went under the 3 to go banner. Gougeard made a little attack, but the others were on him in a flash. Two K’s out and BMC came through for some work, but the lead was still at 20 seconds. Venter made a big jump and Bouet joined him as the peloton was engulfing the others in the break. LottoNL-Jumbo hit the front with Orica-GreenEDGE’s Daryl Impey, Tosh van der Sande (Lotto Soudal) and Van Poppel tucked in nicely for the final lunge. Impey was first to go, but Van Poppel had the speed to pass him in the middle of the road with Van der Sande mopping up third place. All the GC men finished in the main group, so no changes tonight. Keep it tuned to PEZ for everything Vuelta. 25. Mike Teunissen (Ned) LottoNL-Jumbo. 25. Diego Rosa (Ita) Astana at 22:08.